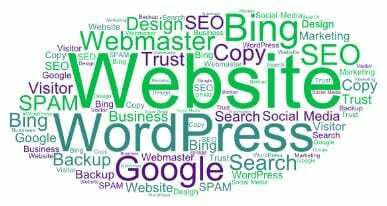 If you read my last post, I outlined many reasons why WordPress is the best solution for your business website. Now that you are ready to move forward, I want to touch on a few more key things to think about. Besides the design or look of your website, there is also a number of key behind the scenes factors to consider. One big factor is the content of your website. Words do matter. Having good copy is vital to your website actually doing its job of promoting your business. You also need to be concerned about how the search engines will view your site. Google and other search engines crawl through the content of your website so that they know how to rank it in their search engines. There is a whole process called SEO (Search Engine optimization) that is vital to the success of your website in marketing your business. Google provides a webmaster service that can help you indentify and fix any issues with your website that may affect people from viewing it, or from it showing up in the search engines. Bing also has this type of service as well. Another key part of your website is tracking the visitors that arrive and view your site. The best tool for that is Google Analytics, another free service that you can connect to your website. You also should need to set up a way to handle Spam if you are recieving comments. And you should have some type of backup system in place. You may also want to run your site on a secure server to increase the trust factor for your visitors. Social media is now a central part of how people use the internet. So integrating your site with your various business social media accounts is critical to successful marketing of your business. There really is much more to a well planned business website than simply just making it look good. Doing things right will certainly pay off in the long run for your business. This entry was posted in Business Basics, Marketing Basics. Bookmark the permalink.